SKU: AFM3-TA1. 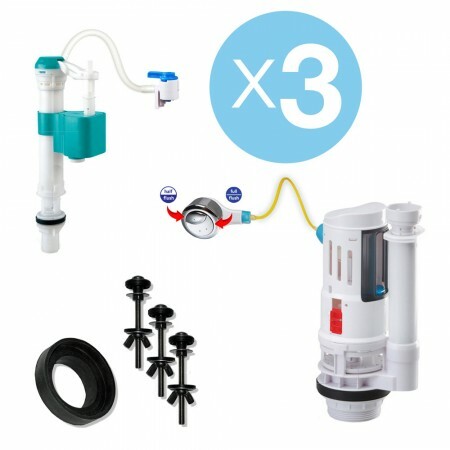 Categories: 2" Valve, 2" Valve, 3" Valve, 3" Valve, Automatic Dual Flush (FlushMinder), Dual Flush Toilet Systems (FlushSaver), Featured, Lever, Lever, One Piece, Two Piece. Ideal for High-Use Toilets, Children, Elderly, Disabled and Cats . . . Yes, Cats ! ! ! Cleanliness: Since no handle is used, automatic flush toilets help mitigate the spread of germs. Versatility: Flush valves using motion sensors can be installed in both homes and businesses and are available in various models. 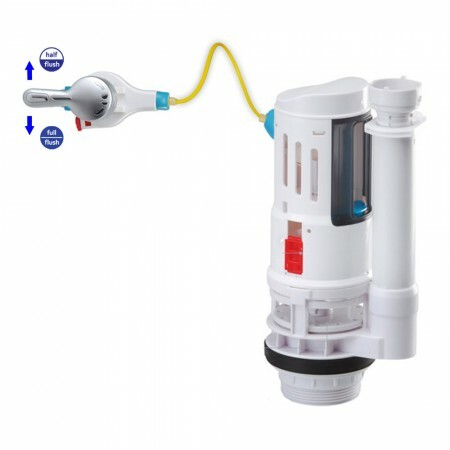 Water Sustainability: Some Automatic toilet kits have a dual flush valve which allows for water conservation in the bathroom. Affordable: Automatic dual flush kits are a much cheaper alternative than purchasing a brand new toilet. For additional information and troubleshooting tips, see this FAQ . . . 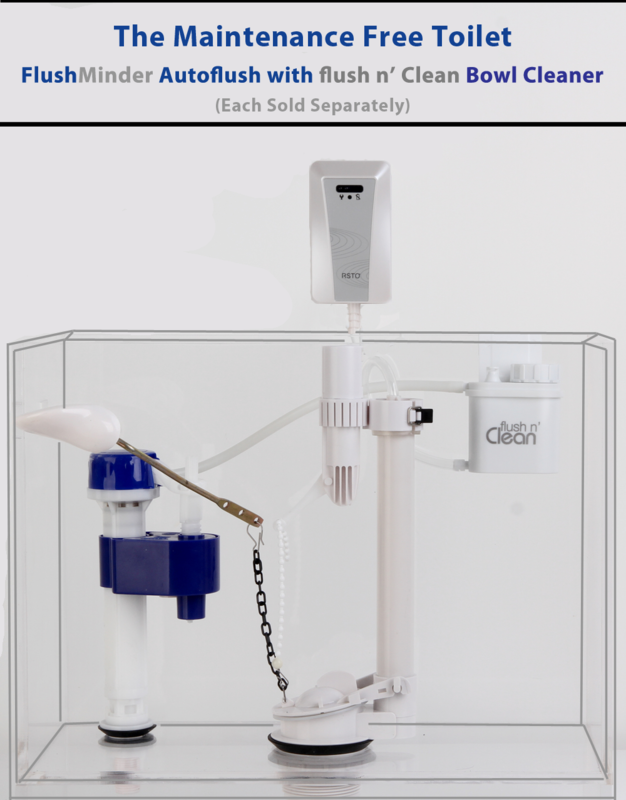 This exclusive and innovative dual-flush toilet conversion system fits most standard lever handle toilets with a flapper valve and is FULLY AUTOMATIC. 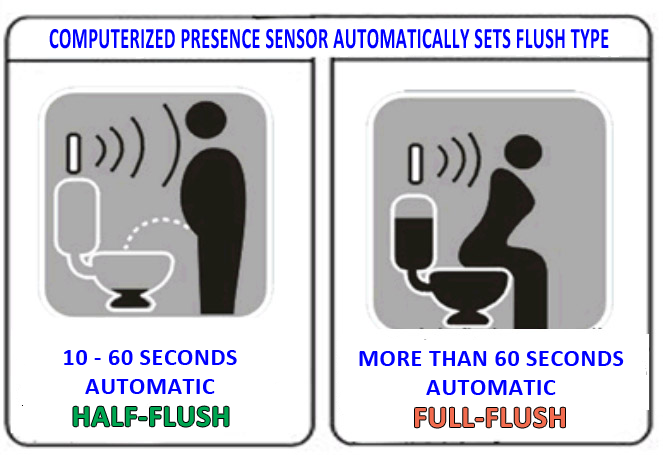 Upon toilet use, a computerized human-presence sensor measures the “time-at-the-toilet” and then automatically activates a motorized flusher inside the tank for a half-flush (#1) or full-flush (#2) as required. Also, one full flush cycle occurs weekly to keep the bowl fresh when there is no usage. 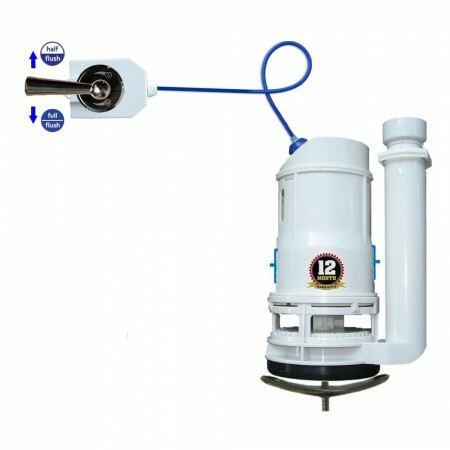 Installation and setup is quick and easy with minimal tools, NO TANK REMOVAL or advanced plumbing skills required. Runs on standard AA alkaline batteries (included) for up to 1 year or 10,000 worry-free flushes. Saves water and improves sanitation – perfect for children, the elderly or any high-use bathroom area where flushing delinquency is a problem. Also makes a great cat potty training accessory for autoflush after use . . . see online for cat potty training aids and information, plus note the reviews and YouTube videos from customer experiences. Results can vary widely, so specific cat potty training setup and instructions are NOT INCLUDED. 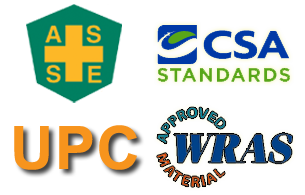 NOTE: Each automatic motion sensor is precisely calibrated and tested before shipment to detect from 0 – 31.5 +/- 4.0 inches (80 +/- 10 cm). Be sure that your toilet and bathroom configuration will allow a suitable installation within this range and with no obstructions. 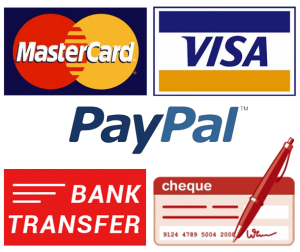 Additional setup information is available on our Troubleshooting and Support page and ALL replacement parts are available separately upon request. 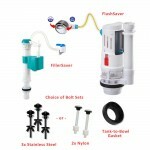 I recently purchased the FlushMinder Automatic Dual-Flush System DIY Complete Kit. My reason for purchase was due to my Cats. My 2 year old cat and 6 month old kitten were about to finish potty training. YES- No more litter box! As I got close to the end of the training I quickly learned that in order to be successful I would need a consistently clean and flushed toilet. Well with 2 cats and a full time job out of the house- the math was not working out! I researched multiple flushing systems and decided the flush minder would best suit my needs. 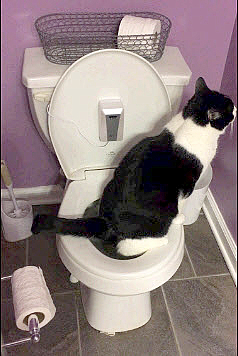 It offered a delayed flush time to allow the cat to finish it’s business before the flush AND a water saving option for when a full flush was not necessary. I would not only be saving on litter costs but now on my water bill as well!! I got the kit in the mail very quick and installed it the night it came. Set up took about 30 minutes with some tweaking. Because the kit is designed for human use I did some minor adaptations to make it cat friendly. I moved the kit from above the toilet to the front of the tank- where the cat would be in view, I also used Velcro to mount so I could adjust and remove more easily, and I removed the toilet seat lid as this was no longer needed after training and I didn’t want to chance anyone leaving it down and preventing the cat from using the toilet. The cats quickly adjusted to this new device on the toilet. They learned that when they are done going it will make a sound and then the toilet will flush. My kitten is sometimes amused by this and runs back to watch the toilet flush. I just ordered a second flusher for my other bathroom so the cats now have 2 places to go, it’s eco friendly and it saves water and money even when us humans use the toilet! Here are two video clips of my cats using the toilet with the FlushMinder Automatic Dual-Flush System. I have two cats that are trained (since they were little kittens) to do their business on the actual toilet and not the messy sand box. The trouble was, I had to flush their business for them, and for the time I went on vacation for a few days, the odor from the toilet from not being flushed was pretty bad. This automatic flush system solved my (cat’s) flushing needs. It installed easily, though I thought the double-sided tape didn’t stick well enough to the tank, so I bought a better tape from 3M which did the trick. I have mine stuck in front of the tank and removed the seat cover so that the sensor can work its best for the cats. Next, I sync’d the timing of the flush (the magnets that’s included in the kit) and adjusted the arm that lifts the flapper valve. Easy, works good. Now, I’m worried that the cats might entertain the automatic flushing system too much. I wish there was some programming on it to not allow no more than, say, four or five flushes a day to save water. Got this for toilet training my cat. She’s been an apprehensive potty trainee, but she finally completed her training kit and now she goes straight to the toilet to do her business, which is awesome except she can’t flush the handle, obviously. So I got this device to do that job for her. 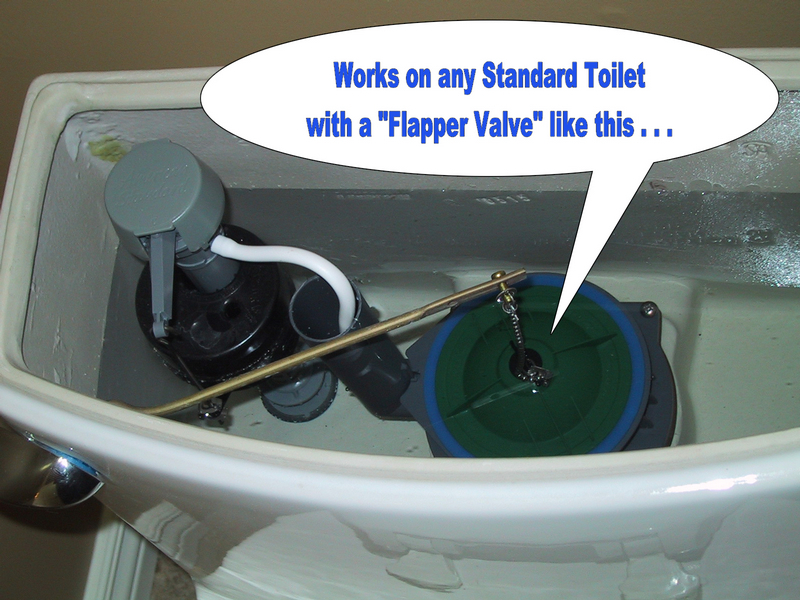 To work for this specific purpose, the motion sensor has to be mounted on the underside of the toilet seat lid which must now be left open at all times because the sensor is connected by a short wire to the mechanism in the tank that does the actual flushing. That’s fine, because we need the toilet seat lid open anyway so the cat can go when she needs to. If you’re getting this for use with human users, just mount the sensor on the wall behind the toilet instead. Anyway, our apprehensive cat has been unsurprisingly apprehensive about the motion sensor stuck to the open toilet lid. It’s going to take some more training for her to get comfortable with both the presence of the sensor and the sound/commotion of the toilet flushing. Fortunately, the way this device works, it flushes VERY gradually/gently reducing the abruptness of the flush as much as possible. So I’m optimistic. But don’t expect to just install this and have your cat accept it; it’s probably going to need some additional training/encouragement. The device might be a bit tricky to install for someone who’s not a DIY’er, so if that’s not you, get your boyfriend/husband/friend/etc to do it for you. Other than that, great product; can confirm the sensor works on cats. Purchased for my TOILET TRAINED cat. After reading previous reviews I was sold. It took a few days for her to adjust as it was something “different”. Praise and treats go along way. Super glad we can leave her knowing there will be a flush every time! I got it for my cat as I am training him to use the toilet. The device is easy to install. It took me around 20 minutes – mainly to adjust/configure the the full and half tank flush. 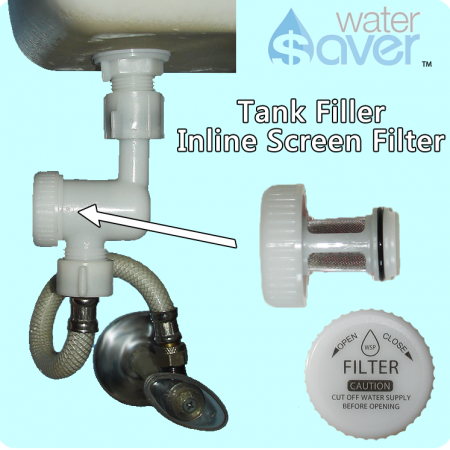 I had to take the lid off the toilet seat and put the sensor on the front side of the tank on the lower part. It waits for the cat to linger and finishes then auto flush about 10 seconds after the cat jumps off. Also the motor doesn’t make much of the sound when it operates so the cat is not disturbed. Love the product! We provide cleaning and maintenance services for vacant apartment complexes. One of our constant problems is keeping the toilet bowls full of water. Few people realize that the water in toilet bowl is not only for catching waste, but also for blocking sewer gasses. So when toilets are not flushed for long periods, the water eventually evaporates out of the bowl and then the sewer gasses escape out and not only smell up that one apartment, but the whole building. We used to have to go around and check all the toilets which took a lot time, but now we just install FlushMinders and problem solved. 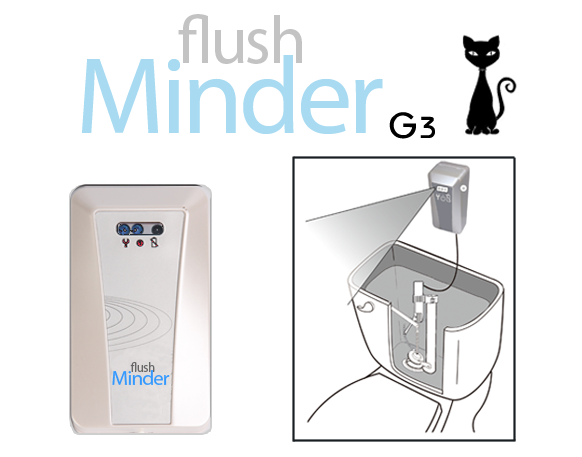 The FlushMinder has this great feature where it flushes once per week whether the toilet is flushed or not . . . perfect for our needs. 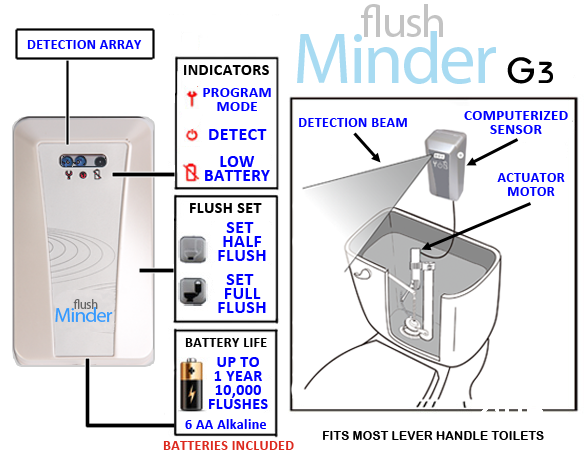 The cost of a FlushMinder is nothing compared to the cost of having to pay a maintenance man to go around and check all these toilets on a regular basis. I’m giving it 4 stars because the programming is limited, but otherwise works great. I install this for my elderly mom who forgets to flush. She keeps asking me what it’s for and i keeping explaining, but bottom line is that it works. I am not all that handy with plumbing stuff, but installed it myself without tools and did not take long. The calibration was a bit confusing, but there is additional information in the FAQ of the website that answered all my questions. Highly recommend!